SSHRC Postdocs: What’s going on? 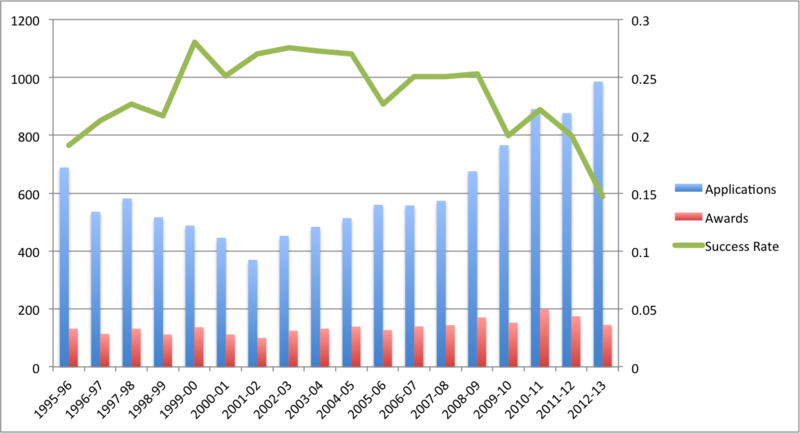 The SSHRC Postdoctoral Fellowship success rate is declining precipitously, continuing a trend that has continued with fits and starts since 1999. 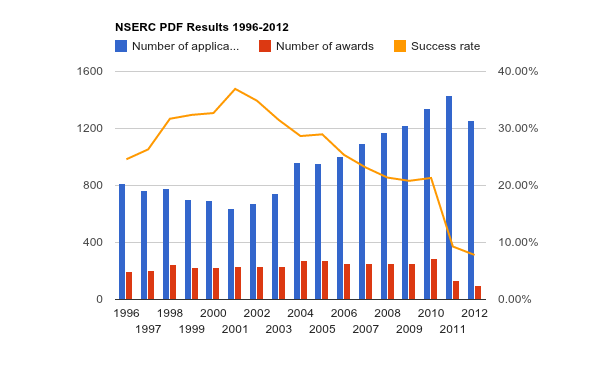 By graphing the numbers found on SSHRC’s own webpage, we can see why: the number of applications is increasing, while the numbers of awards have generally not kept pace (and disturbingly, have actually been declining since the 2010-11 academic year). Bear in mind the broader context of these figures: graduate growth in Ontario (Canada’s largest province), encouragement by governments to grow even further (6,000 more spots announced in 2011 at the MA/PhD level), and even some public hand-wringing about whether we’re producing too many PhDs. Even if we argue that not all PhDs will end up as academics, the rising numbers of applications indicate that many do want this position. Recent changes to the SSHRC program, which I’ve also blogged about here, are clearly aimed at bringing that success rate back up (in short: limiting the chances an applicant has and limiting it to people who have never received a postdoc of any kind). They’re going to do so by cutting the number of applications. If we take a low success rate as a problem, there are two solutions: (a) lower applications; or (b) raise awards. I suppose (a) is an easier solution. Above, we see postdoc applications plotted against the Canadian unemployment rate. There is a positive correlation here, although not terribly strong. Who knows if we’re seeing causation or causation, but I would suspect if we had a very low unemployment rate, other opportunities would present themselves to graduate students on the fence between academic and professional employment. But isn’t this just a bunch of spoiled poets complaining? A common objection to this hand-wringing is that it often comes from the humanities. Many colleagues have a rough idea that while things are bad for us in the social sciences/humanities side, the hard sciences have an advantage. Recent announcements about the NSERC Postdoctoral Fellowship program, however, and figures put together by my friend Brent Pym (a PhD Candidate in Math @ U of T), help dispel this grass-is-greener myth – indeed, NSERC had just a 7.8% success rate last year! Indeed, NSERC applicants can only apply once (!!! ), which creates a number of difficulties for them: do they chance an application during their last ABD year, knowing that their success rate will be lower… or do they wait until that first year post-PhD, when they have a better chance, but may have trouble supporting themselves during the year in between? Given the vagaries of selection committees, limiting an early career scholar to one application is ludicrous. (a) lack of coordination between provincial and federal governments: graduate growth at the provincial level is not being met by equivalent support from the federal gov’t. (b) the problem of growing graduate education, which is usually conceived of as professional training for the professoriate, while simultaneously letting the professoriate atrophy. (c) ham-fisted attempts to bring those declining success rates back up. 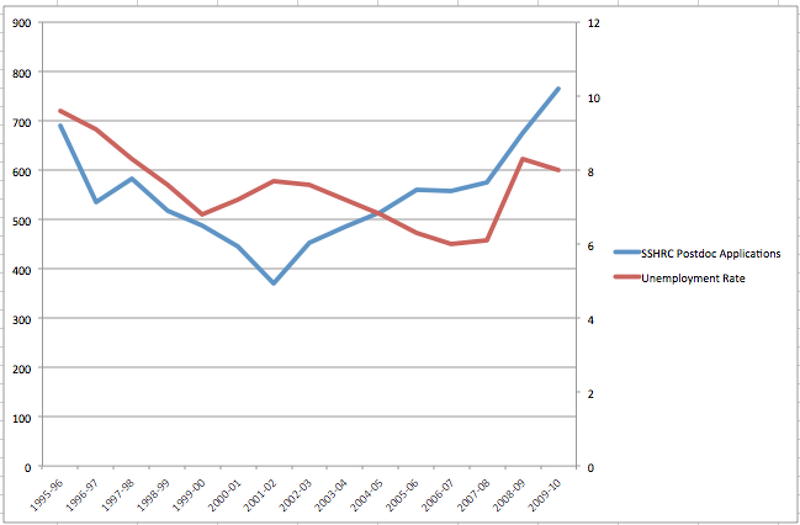 (d) high unemployment rates in the economy more generally are driving some applicants towards the SSHRC process. Great post, scary graphs, thanks!